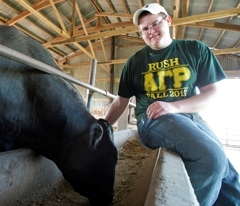 Joseph Huebener, a senior from Brighton majoring in agricultural systems, takes a minute from his workday with Louis, an Angus bull. Huebener recently completed an Undergraduate Research Assistantship, monitoring feed intake and how different factors affect feed efficiency in young bulls. As part of his daily activities, Huebener cared for 52 bulls on consignment for the 2013 Annual Bull Test. He assisted with data collection, animal care and treatment, and feeding. Huebener will graduate May 11, and in addition to working on his family’s farm, he has a job lined-up that will put his agricultural technology skills to work.